The Village Partnership is a development program HANDS was involved with for more than eight years. It is implemented in various urban slums and rural areas in Cairo and Upper Egypt, one area at a time. The program aims to support locally initiated projects that bring improvements in health, education, housing and environment, agriculture, economic assistance, and human rights. The program is based on the understanding that poverty is a complex social phenomenon that must be addressed through an integrated approach that combines various development activities in a targeted community and engaging the active participation of beneficiaries. 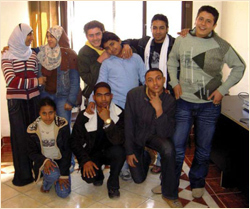 After the success in the village of Jafaar and the continued improvements in El Ashmoneen and Estable Antar, HANDS, in collaboration with Egyptian partners, CEOSS, one of Egypt’s largest social service organizations, has begun a new project to combat child labor in Salam City, an underdeveloped area of Cairo. Salam City is located on the outskirts of Cairo and contains an estimated 5,000 workshops that employ approximately 20,000 children in car-painting, mechanics, carpentry, welding and other labor-intensive professions. In addition to dangerous working conditions, children in these workshops often face mistreatment by employers. The city’s child workers frequently work more hours than the legal limit, do not receive promised daily meals and are sometimes even exposed to physical abuse. Very often, these children drop out of school because of their work commitments. Without education, their choices for the future remain limited.